Data management is a big issue for academic researchers. Increasingly, applications for grant funding ask for detailed plans on how the researcher will handle data generated by the study, such as spreadsheets, software, text, algorithms or images. These plans need to specify how the data will be organized, shared and safeguarded. How it will be backed up and stored long-term. And how it will be described so others can use it in an open-science environment, or to reproduce results of the study. In response, academic libraries across the nation have taken a leading role in offering training, software and services for Research Data Management (RDM) – including the Spokane Academic Library at WSU Health Sciences. 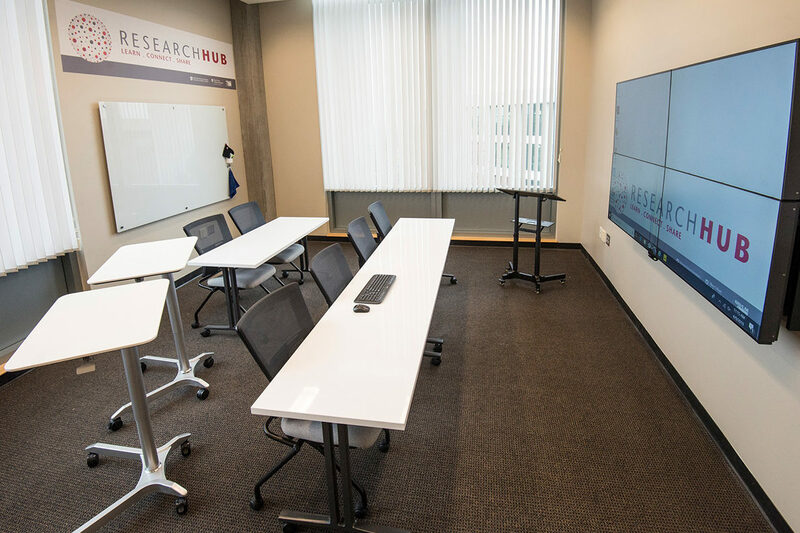 The library recently created a Research Hub offering technology-enabled spaces, software, informational programming, web resources and one-on-one consultations. It’s available to faculty, students and staff at both WSU and Eastern Washington University who are engaged in research. “It just seemed like a lot of people needed help on their data processes, and we wanted to bring more support for our campus,” said Kathryn Vela, Health Sciences Outreach Librarian. The Spokane Academic Library used a grant from the National Network of Libraries of Medicine Pacific Northwest Region and the WSU Elson S. Floyd College of Medicine to create the hub on the library’s third floor. Groups can reserve the space, which includes whiteboards, whiteboard tables, a video wall and data analysis and visualization software. Vela said the library has long offered many resources for researchers, but until the creation of the Research Hub, they haven’t been in a central location. Vela and Electra Enslow, Head of Library Research and Instruction at the Spokane Academic Library, say they hope the Research Hub will become a model for other libraries in the WSU system. “Having more of a systematic way of managing data across all of WSU’s campuses is the goal,” Enslow said.